Sally Parsons has had this vision for as long as the memory can stretch. She is a Board Certified, Naturopathic Doctor and owner of the Herb Shop * Healing Center. 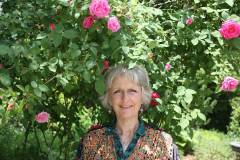 She has been working with plants for over thirty years and has also completed an Herbal Certification Course back in the 90’s at the Living with Herbs Institute in Atlanta. She is a Certified Foot Reflexologist (offers 1-hour Reflexology Sessions for $50, call for an appt. ), studied Aromatherapy under Roz Zollinger and received her Doctorate of Naturopathy from both Clayton College of Natural Health and Trinity School of Natural Health. Read below about the Nutritional Response Testing offered by Sally at the Herb Shop * Healing Center. Please call 770-704-9950 to schedule an appointment with Sally!